Contraction and convergence in practice?? The in-tandem announcement last week by the USA and China caught many by surprise, resulted in lots of applause and back slapping and then raised questions as to which country has the tougher or easier deal. A bit of simple analysis offered below may help answer that question. In the long period between Kyoto and Copenhagen as commentators saw that the Kyoto Protocol probably wasn’t going to be sufficient to rein in global emissions, various ideas (re)appeared as to how the future reduction burden should be shared, particularly amongst countries with widely different development pathways. One idea that gained considerable prominence was known as Contraction and Convergence. In fact this idea was first proposed in 1990 by the Global Commons Institute (GCI). Contraction refers to the ‘full-term event’ in which the future global total of greenhouse gas emissions from human sources is shrunk over time in a measured way to zero net-emissions within a specified time-frame. Convergence refers to the full international sharing of the emissions contraction-event, where the ’emissions-entitlements’ for all countries result from them converging on the declining global per capita average of emissions arising under the contraction rate chosen. Last week the USA announced reductions of 26-28% by 2025 relative to 2005 and China announced a peaking in emissions by 2030. There really isn’t enough information given to fully dissect this, but a few simple assumptions makes for an interesting observation. For starters, I have assumed that energy emissions are a proxy for total emissions, in part because energy information is so readily available whereas information on methane, other GHGs and land use is much more difficult to piece together. The second assumption is that the 2020-2025 annual rate of reduction in the USA of about 2% p.a. continues through to 2030 (i.e. a reduction of 37% in 2030 relative to 2005) and the third assumption is that China exhibits a noticeable “glide path” towards a 2030 peak, rather than extreme growth that comes to a shuddering halt. At least for energy emissions, the picture looks something like the one below, but in the language of convergence, i.e. emissions per capita. What becomes apparent is that the USA and China appear to have adopted a “Contraction and Convergence” approach, with a goal of around 10 tonnes CO2 per capita for 2030, at least for energy related emissions. For China this means emissions of some 14.5 billion tpa in 2030, compared with the latest IEA number for 2012 of 8.3 billion tonnes, so a 75% increase over 2012 or 166% increase over 2005. It also has China peaking at a level of CO2 emissions similar to Europe when it was more industrial, rather than ramping up to the current level of say, the USA or Australia (both ~16 tonnes). By comparison, Korea currently has energy CO2/capita emissions of ~12 tonnes, so China peaking at 10 is some 17% below that. 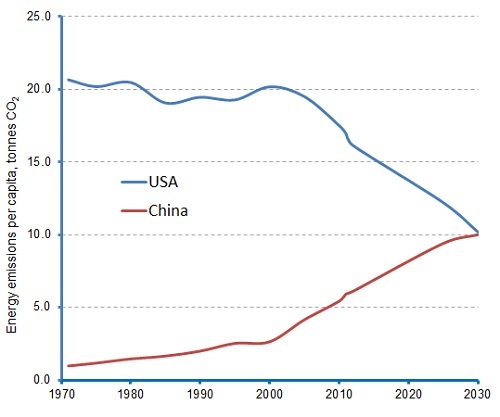 If the USA and China stayed in lockstep after 2030 with the same reduction pathway that plays out in the USA over the period 2020-2030, that might mean 6.6 tonnes CO2 per capita by 2040, or 9.5 billion tpa for China, which is still slightly higher than the current level. The reality distortion field is as strong as ever!